As you'd expect, Pokemon Go legendaries are some of the toughest Pokemon to catch. Most legendary Pokemon in Pokemon Go are found from level five raids, but not all. You can also complete dedicated special research tasks for specific Pokemon, and completing seven days' worth of field research tasks will reward you with a random legendary Pokemon from a small pool. The Pokemon Go legendaries available are constantly changing though, as more get released and the game progresses. 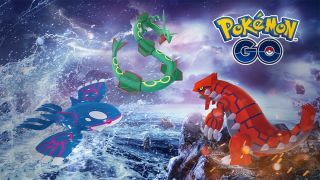 Catching all of the legendary Pokemon is a slow burn because not every single one is available at any one point, but we've got the full list of legendary Pokemon in Pokemon Go here so you can work out which ones you still need to catch. Right now, Dialga is the only legendary Pokemon available in level five raids. The majestic beast from Gen 4 replaced Palkia who is sadly no longer available, and Dialga is expected to remain in level five raids until the end of the month. This is the only way to obtain Dialga, so grab some pals and start raiding. Right now, Deoxys Attack Forme is the legendary Pokemon exclusive to ex-raids. If you're unsure what an ex-raid in Pokemon Go is, venture over to our Pokemon Go raids guide which also includes counters for all of the Pokemon available in raids right now. Mew was the first legendary Pokemon available via special research, in a quest line called "A Mythical Discovery". This is the only way to obtain Mew, and you can read more on that with our how to catch Mew and Mewtwo in Pokemon Go guide. Celebi is also now available through the "A Ripple In Time" special research quest. Just like Mew, you need to do a series of potentially lengthy tasks, which we've covered in detail here: how to catch Celebi in Pokemon Go. Technically, Meltan and its evolution Melmetal are mythical Pokemon instead of legendaries, but for the purposes of this guide, they count as legendaries. We've covered how to catch Meltan in Pokemon Go and Pokemon Let's Go but the basic gist of things is that you either need to transfer a Pokemon from the former to the latter, to receive Meltan in the former, or complete the special research called "Let's GO, Meltan. When you complete seven pieces of field research, you'll earn a special reward encounter with a legendary Pokemon. This can be one of many, and is the only way to obtain these legendaries at this point in the game. They all used to be available as level five raid bosses, and they've now returned as field research rewards. - It’s disappointing but don’t expect to catch on your first Raid. The catch rates differ per Legendary but the odds are not high. - Take friends to not only support the attack but also net you extra Poke Balls. Dependent on your in game relationship status with Pokemon Go friends, you’ll earn more Raid balls and they definitely come in handy. - Throw your Poke Ball after a Legendary has just done its attack move to make sure they don’t just flick your Poke Ball away. - If you are having trouble with Raid numbers, try signing up for your local Discord or Facebook Pokemon Go community. There’ll be plenty of people in the same situation and organising Raid groups.